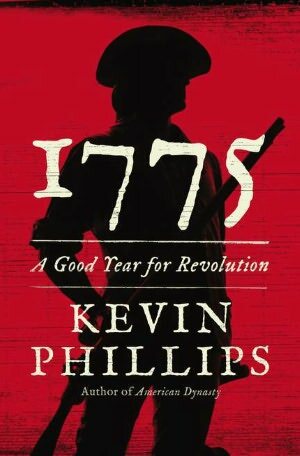 In his recent review of Kevin Phillips’s 1775: A Good Year for Revolution, Jack Rakove argues that in tackling the causes of independence, “Phillips deals with political loyalties more fundamental than the mere matter of party allegiance.” The inference is clear—deciding to be a member or an activist for a political party is one thing; but your nationality is something that defines you in perpetuity. Once revolutionaries chose to take on the label ‘American’, there was no turning back. It was who they were; while that American identity might be complex and multifaceted, there is something about “national character” that stands above the rough and tumble of party politics. This strikes me as a misguided view of national identity in the revolution, not least because in the early stages of the revolution, American partisans were not defined by national labels, but rather as “Whigs” and “Tories”—political labels above all others. Indeed, even a close focus on 1775—as nationalist labels begin to harden in the crucible of war—shows that political labels were absolutely critical to the processes that defined the revolution. Popular movements which had relied on a vague sense of unease against specific British measures were suddenly asking people to sign on for an all-encompassing revolution. It was for this reason Richard Ryerson identified 1775 as the year in which the revolutionary coalition in Philadelphia came closest to breaking down. But the importance of political labels did not stop with the outbreak of the Revolutionary War. Francis S Fox’s superb study of Northampton County, Pennsylvania, shows how in many ways “American” was a term that was a proxy for a particular type of political ideology that caused great hardship for many who considered themselves to be patriots, but were uneasy at the thought of adopting revolutionary ideas wholesale. And once the war had been won, “American” was hardly the only label with salience in the new republic. Quite apart from the contrasting state loyalties many possessed, the political notion of being a “Whig” in 1775 and 1776 was frequently brought up to establish a claim to legitimate authority into the 1780s and 1790s. Only very rarely in life does one get to choose a nationality. (Those who do are often caught uneasily between two cultures into which they never completely fit.) One is born into the passport claimed as a “birthright.” Yet people spend considerably more time thinking about the political ideologies that define them, and the political parties they will identify with and vote for. It seems to me that in day to day life, self-identification as “conservative” or “liberal” (or “moderate” or “progressive”) is often far more deeply meaningful to an individual than being “American” or “British.” People may claim that nation is more important than party, yet assertions of “national interest” often are more reflective of a partisan ideology than anything that can genuinely encapsulate and accommodate an entire community. Indeed, those who advocate the most partisan political programs are often those who wrap themselves most tightly in the flag. What I find particularly odd about this is that America’s revolutionaries were most successful when they didn’t essentialize their definition of national identity. 1775 is an important case in point—it was at this point that there were almost as many plans for independence, resistance, or reconciliation as there were politicians. Defining patriots according to a narrow political ideology would have blown the patriot coalition apart in the early stages of the War of Independence. (I dare say, too, that the bulk of the patriots had considerably more radical and revolutionary tendencies than those espousing more classical political thought. Similar factors were at play in the debate over the ratification of the Constitution—though the Federalists were arguing for a highly partisan political program, their ability to couch it in an inclusive language of broad appeal (matched by an inclusive mobilization network) saw their arguments prevail. Throughout the Revolution, nationalistic appeals to the people had to be kept broad and often remarkably vague. This was precisely because the American effort in the war could only succeed by mobilizing large swathes of the population; an essentialist view of what it meant to be a patriot (beyond the willingness to fight for Independence) would have fundamentally weakened the movement. Ultimately, it was the malleability of a nationalist appeal that allowed so many people to attach their more deeply held beliefs to the flag. Nice piece. I think a few things are going on here. The first is the notion that “politics” can exist in two temporal dimensions: the everyday sense of partisan conflict and negotiation, and the longer-term sense of collective identity formation, wherein we find our “imagined communities.” The story of 1775 is the transformation of one sort of politics into the other. The argument between Rakove and Philips seems to boil down to whether we can assign economic or ideological causes for this kind of large-scale historical transformation. I don’t expect this argument to get resolved any time soon. The other issue seems to involve whether the everyday or identity-based forms of political affiliation exist in some kind of hierarchy or causal priority? When does one feel, or is felt to be, more “American” than “conservative,” or vice versa? My suspicion is that these self-definitions are highly conditional, and dependent upon outside events and discussions to be made manifest. We can see something like this happening, I think, with ideologies of gun ownership, which are getting peeled away from conservative and nationalist ideologies in this country. But I don’t think these movements and reconfigurations are possible except under pressure from current political events and arguments. Thanks for your thoughtful reply, Dave. On reflection, I think one of the things I underplayed is the longer term cultural conflict over identity, though perhaps I am predisposed to see even these changes as fundamentally political and thus heavily events-driven. As to your second point, I think the question of malleability raises its head again. It is considerably easier, to use your example, to describe yourself as American and pro-gun control, than it is to describe yourself as conservative and pro-gun control. Slowly, that is changing, but precisely because political allegiances are chosen, it is easier to draw a tighter ring around it. Again, changes in this will be primarily events-driven; what I think would be really interesting to trace would be when there are attempts to portray very specific ideologies as patriotic rather than merely politically partisan. I have a problem with the whole concept of American nationalism especially in regards to the time period. Recent works by Rogers Smith and Douglas Bradburn have illustrated the breadth and width of the political contestation over citzenship in the early American republic. Did they use the verb “is” or “are” when referring to the United States in that era? Mr Mazella is correct when he states their “self-definitions are highly conditional, and dependent upon outside events.” Their identities and their bonds of community were flexible and the threads of the community’s tapestry could unravel if pulled to hard as the later debates over naturalization end expatriation would show during the 1790s. I have not read the Phillip’s book, but I enjoyed reading the Rakove review and your post. They warmed my Central Illinois morning, Professor Owen. Thanks for the kind words, Brian! I haven’t looked at the use of singular or plural directly – if it’s anything like the first research question I ever tackled, I suspect that both were used. Alternatively, they had different ways of expressing it – ‘the United States are’ or ‘America is’. But I’ll certainly keep an eye out for that usage in future research. I wonder if David Hendrickson has investigated this at all? A perfect prologue to my dissertation, Ken! My research focuses on how local identities remained long after the Revolution, and how ideas of nationalism were tethered to provincial ideas and local political allegiances, so this is really helpful. We will have to converse more about this, Ben – I have a few ideas knocking around about party allegiance in the early republic that I’m trying to clarify before turning into article form, and the interplay between local and national features heavily. Political allegiance also plays a key role in the literary nationalism I study — but more at the beginning of the 19th century (especially before the War of 1812) than in the second quarter, and not really in the way the New New Political History, with its focus on party as a driver of popular participation, implies it should. I think your post is helping me identify the problems at stake. American reactions to Joel Barlow’s “Columbiad” are a handy example; ostensibly, the poem wasn’t a partisan production at all, but Federalist literary reviews savaged it and Republican newspapers rushed to defend it, apparently because of its claim that the formation of the United States marked the beginning of a new intellectual age. A nationalism that would remove the American mind from the springs of tradition (and Federalists specifically attacked the poem as irreligious, though Barlow claimed it was merely anti-Catholic) was a poem with a partisan valence. But Barlow presented it as a sort of inclusive epic, encompassing everything American, from New World flora and fauna to George Washington’s firmly set lower jaw. In a sense, I think, my dissertation is about literary intellectuals’ continuing attempts to depoliticize and delocalize national identity after 1815 — and about their failures in that project thanks to the elusiveness of a substantive American collective identity. The construction of Americanness as an *individual* identity was an ostensibly apolitical project, but in practice it was impossible to extricate individuality from class, race, and cultural attachments with partisan implications. Really quite excellent. Great post-holiday palate cleanser. I find it interesting that many commentators (historians, theorists, or otherwise) tend to treat partisan identification (Whig, Tory, Republican, Democrat, etc.) as some sort of false-consciousness in favor of ideological (liberal, etc.) and/or nationalist (American, etc.) identification. Does having a partisan identification mean anything or have any content? I think so, but sometimes reading the literature one would think not. I think one other thing that needs to be considered is the social importance of political allegiance. Just off the top of my head, it could determine which taverns you drank in, who your business associates were likely to be, and what sort of governmental contracts might or might not be sent your way. I think that many people today don’t leave a political party even if dissatisfied with the leadership because it would be such a rupture to their social life. VERY speculatively and generally speaking, it has always seemed to me that the Revolution rested on much more than the development of numerous critiques of varying validity of British government and that, contrary to “Anglicizationists” like McConville, there was an underlying process of cultural detachment-in some aspects, decades in the making-that contributed to the sense of alienation from both the British government and the empire in general, thus clearing a space in which a new political/”national” identity could take hold. We may be running into problems here because of the difficulties of my ideology/identity dyad: obviously these are both very difficult terms, but I was trying to contrast the more transient aspects of political controversy with the much longer-term formations (that also include all the un- or semiconscious aspects of political behavior like social drinking, conviviality, associations, etc.). Studies of political “cultures” are supposed to comprehend both these temporal perspectives, but they tend to focus on one or the other. To use Jonathan Wilson’s example, the literary intellectuals attempting to de-localize American identity were using Barlow to posit an Americanness that lay above and beyond local, immediate conflicts. In other words, to redirect and reformulate an “American” culture and identity in a more general and lasting way. Since I work on the British side of these questions, I can tell you that John Wilkes is a good example of someone who had a huge impact on transient events and discussions, but who left most of the political and party structures he worked in untouched. By the time of the Revolution, the Wilkite identity effectively becomes irrelevant, I think, for British and colonial politics. Can I simply just say what a comfort to uncover someone that really knows what they are talking about on the internet. : La Diète 3 Semaines.